With the addition of a facebook fan box to your website you’re not only benefiting your end users but also yourself. The fb fan box allows users to directly view how many friends you have on your facebook page and also allows them to become a fan with just one click. The only potential downsides to adding a fan box to your page is that it is not easy to customize or the original styling just doesn’t match up with the unique style of your site. Well not anymore, in this tutorial we are going to teach you how to customize your very own facebook fan box. This tutorial will teach you step by step how to customize your facebook fan box to look like ours. After completing this tutorial you should be able to play around with the code and make modifications that you see fit to change the styling to your own needs. 4/29/10 – This tutorial has been updated to allow full customization of the Facebook Fan Box and positioning of the new “Like” button. First things first you need to get the code for your facebook fan box from facebook, your code should look something similar to the code below. The second step is to set up the linking to your css code and adjusting your facebook fan box code to allow for the customization you’re about to start. The div associated at the end of the original fan box code is only a link back to your facebook page, we decided to remove it, however you may choose to leave it. Items that we have changed in our code are the width from 300 to 240 and connections from 10 to 8, your width and number of connections may change depending on the space available for your fan box. Items we have added are height at 200 (also subject to change) and the line of code to link to our css stylesheet. Please view the updated coded below. One important item to take notice of is ‘?1’ which appears at the end of the css link, this item is the cache level for the facebook fan box, every time you make changes to the css inside your stylesheet and upload to your server you must change the number after the question mark to correspond with the number of edits you have made. The first step in customizing the css is to fix link hover issues and to remove any unneeded styling from the main widget. Check the first set of css modifications below. In lines 1 through 3 of the code we have removed the underline hover effect for all links inside the fan box to avoid any type of conflicts. In lines 4 through 9 of the code we have removed the border from around the full fan box widget, set the height to match our widget height, removed the background, and positioned it to allow for the moving of the “Like” button. One thing to keep notice of is the usage of ‘!important’, this is a css trick that will override the already used css code inside of the widget, anything that we change that currently has any values associated with it must use this code or else the original code will still take priority. The second step in customizing the css is to adjust the fan box header. 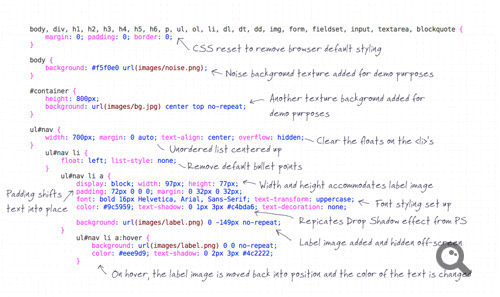 Check the second set of css modifications below. We are basically going to be getting rid of everything in the widget header except for the “Like” button, which we will position to the bottom of our widget later. In lines 1 through 4 we have gotten rid of the light blue background color for the header and removed all of the headers padding. In lines 5 through 7 we have completely removed both the main profile name and image. In lines 8 through 10 we have removed padding associated with the “Like” button that was not needed. The third step in customizing the css is to adjust the actual fb fan connections. Check the third set of css modifications below. In lines 1 through 8 of the code we adjusted the padding surrounding the fan box connections, removed the border at the top, and adjusted the font for the line of text that displays “X people like Profile Name”. In lines 9 through 12 of the code we have adjusted the color and font weight of the number of fans displayed. In lines 13 through 15 of the code we have adjusted the padding between the line of text and the actual fan connections. In lines 16 through 18 of the code we have adjusted the padding between the actual fan connections. In lines 19 through 24 of the code we have adjusted the actual fan name, make sure that you DO NOT change the font family, if changed it may cause alignment issues with the connections. The fourth and final step in customizing the css is to position the “Like” button. Check the fourth and final set of css modifications below. With the addition of this block of code the “Like” button will now appear at the bottom right of our fan box widget. How does this work? It works because earlier we used relative positioning on the main widget div in Step 3, whenever relative positioning is used on an element you can then use absolute positioning to position another element anywhere inside of the main element. The way to position the element is by using the attributes top, bottom, left, and right depending on where you want to move the element. In our situation we wanted it to be at the bottom right of our widget so we used the attribute bottom with a position of 0 and right with a position of 10px. The reason we used 10px for right instead of 0 is because we had added 10 pixels of right padding to each of our fan connections, this way the button and fan image will line up correctly. Lines 1 through 6 of the code are used to position the actual div to the bottom right of the widget. In lines 7 through 12 of the code we have removed padding and margin associated with the “Like” button and its surrounding table data so that it will align properly. 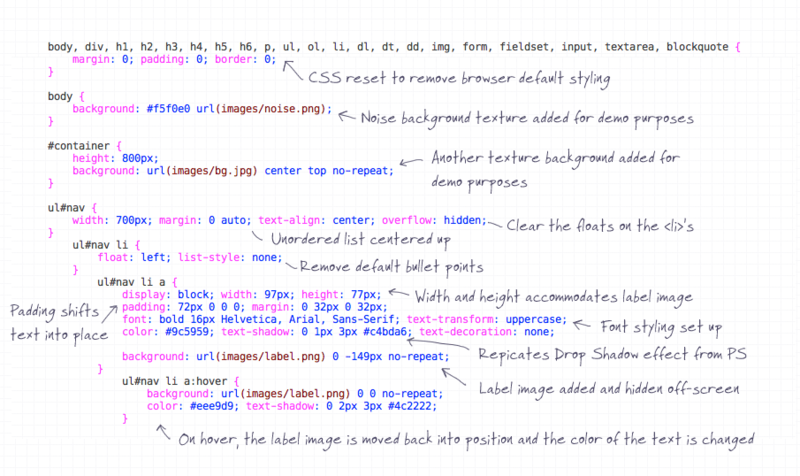 Below is all of the css code from the previous 4 steps combined together. If you are trying to edit the css and no changes are showing up, make sure you are adjusting the cache level at the end of the css link in the widget code. 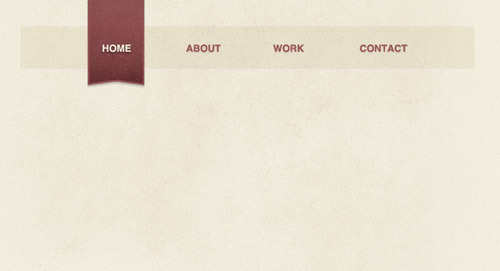 Create a new document and fill the background with a light beige. 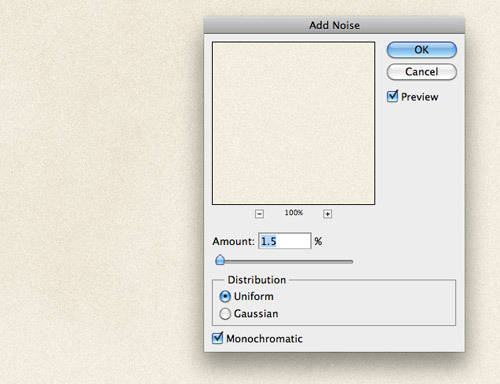 Add a subtle 1.5% noise texture by going to Filter > Noise > Add Noise. 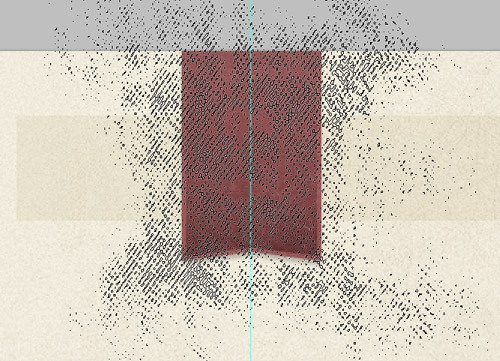 Use a subtle grunge Photoshop brush to add a little extra texture to the top centre of the canvas. Adjust the opacity to tone down the distressed effect. 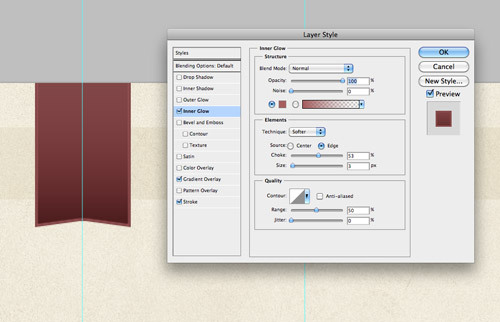 Draw and fill a rectangle to create the base of the label graphic. Press CMD+T to transform the shape, then drag a guide to highlight the centre point. Use the Polygonal Lasso tool to draw a small triangle. Use this triangle to clip out the bottom edges. 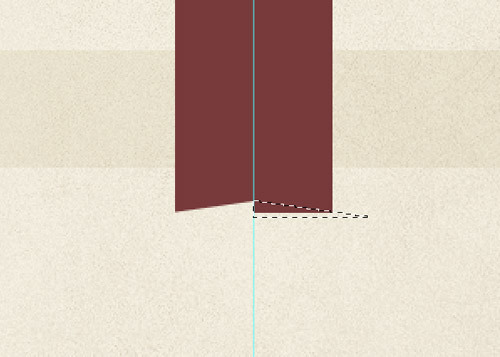 Flip the selection horizontally and align with the guide to ensure the clipping is symmetrical. 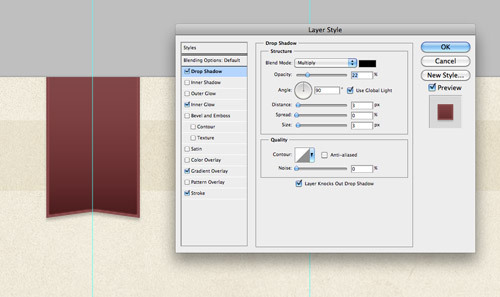 Begin adding a range of Layer Style effects to bring the label to life. 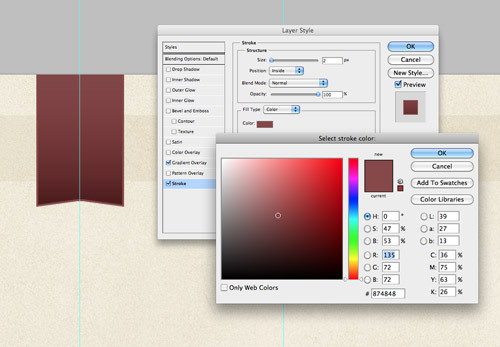 Start with a Gradient Overlay to add a range of dark to light red tones. 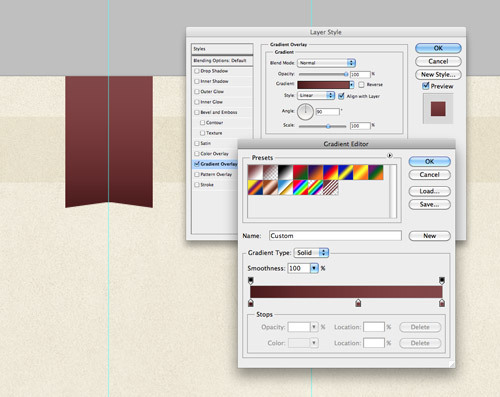 Add a thin stroke using a dark red colour selection with settings of 2px width and aligned to the inside. 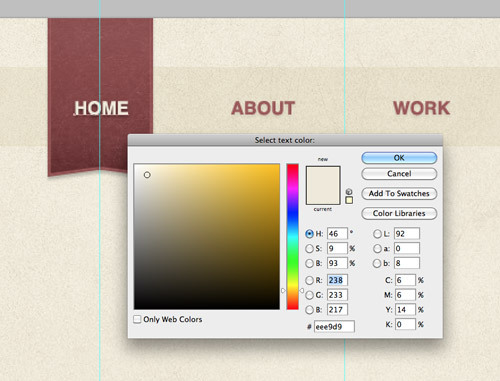 Set up an Inner Glow using a slightly lighter red with 100% opacity, Normal blending mode, 50% Choke and 3px in size. 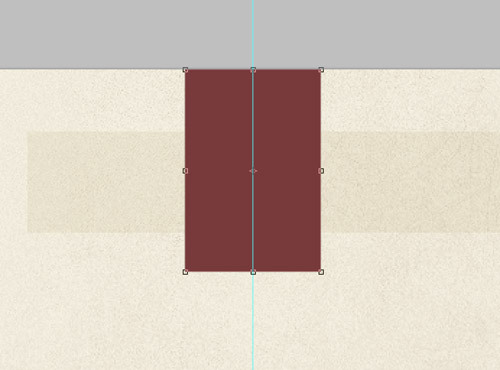 Add a soft Drop Shadow aligned to 90 degrees to give the impression of depth. Reduce the opacity to around 20% to tone down the effect. 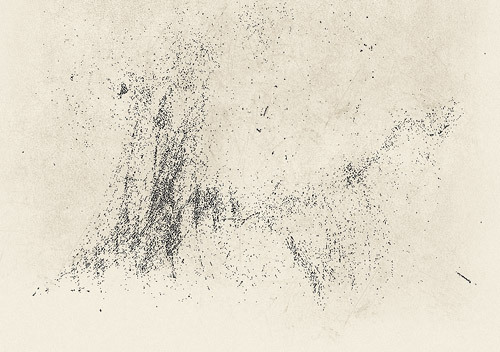 Finish off the label with a distressed texture using the subtle grunge brushes. 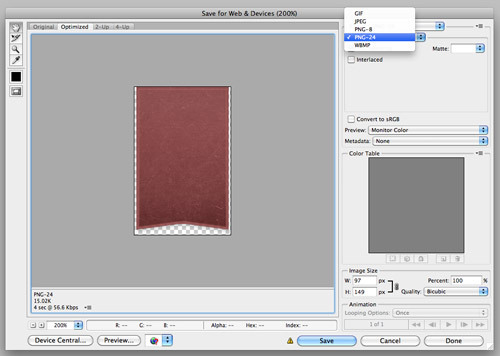 Load the selection of the label shape, inverse and delete out the excess. Change the blending mode to Lighter Color at 35%. All the menu needs now is a series of text links. Set the fonts up with Helvetica Bold and choose a fill colour from the label. 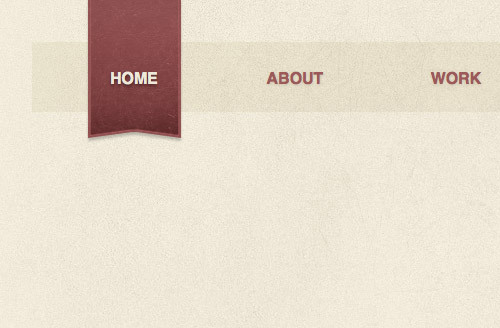 Simulate the hover effect by switching the fill to beige on the active link. Make a selection of the label graphic and export the image as a PNG24 file with Alpha transparency. 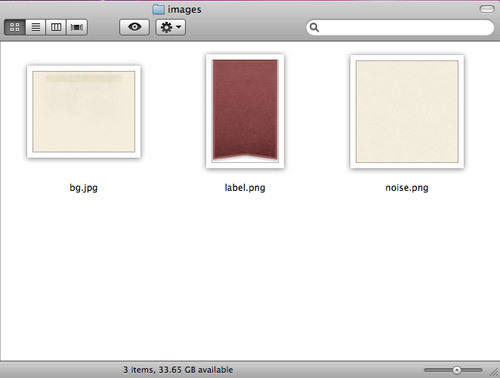 The demo file uses just three images: A textured background image, the red label graphic and a repeating noise texture. I decided to explore the area of css3 keyframes animations. The idea was simple – to create a sort of virtual postcard. I live in Paris so obviously I send you my greetings from Paris :). Click here or on the image to view the animation demo. Android 2.1+ (source Smashing Magazine). We are going to animate 3 elements : the clouds (there are three layers of clouds), the rotating phare light and the Eiffel Tower sparkling. To animate the three layers of clouds independently we use the following keyframes. (Notice that each time I use the -webkit- and -moz- prefixes). to associate the animations with the proper elements and to define the duration, timing-function and iteration count, respectively (I use the shorthand notation). This time we are going to simultaneously animate the opacity and rotate the phare light with the rotation origin in its top center point (as in the image above). (here and further, repeat the same with -moz- prefixes). We will animate the #eiffel_wrap, #sparkling1 and #sparkling2. The idea is to use the sparkling animation to turn out and in the #sparkling1 and #sparkling2 elements within the 0.4s cycle, with the first in/out when the second is out/in. To achieve that we will delay the sparkling animation of 0.2s on #sparkling1. In Paris this beautiful evening spectacle may be seen for several minutes every full hour. We will use the#eiffel_wrap element and eiffel_wrap animation to recreate this effect (not literarily though – I will not make you wait an hour long). With -webkit-animation-timing-function: steps(1); the transition is instantaneous with no fading out effect. I hope you found this tutorial useful and got inspired. Please share and bookmark if you like it. As always I’m looking forward to your comments and… see you in Paris ! A common feature of Facebook is the use of being able to ‘Share’ objects whether these objects are videos or links. If you’re anything like us then you like to have full control over what and how you share it, this proved rather difficult until now. In this tutorial we are going to show you, in two easy steps, how to create a custom Facebook ‘Share’ button to use on your Facebook iFrame tab that will allow viewers to share and post your custom content to their Wall. The difference between this ‘Share’ button and the standard ‘Share’ button is that every element (custom message, custom title and custom thumb image) within the share window is completely customizable, giving you total control over what you want to share. Keep note that the $url section must contain a URL. This directs people to your tab once the share has been published on the poster’s wall. Also, the $image must contain a full URL. If your link to the image is “images/share-thumbnail.jpg”, it will not be read correctly because the share window is coming from Facebook’s server, not yours. As for the size of your thumbnail image ($image), it will automatically be proportionately resized to fit either 100px wide or 100px tall (depending which measurement is larger of the original image). So ideally, you should make your thumbnail 100px X 100px to prevent unwanted resizing. As you can see, the onClick=”window.open(‘…’);” will create a popup window that contains the ‘Share’ information (see picture above). Do not change this information. The only bits of coding you need to change are the width and the height of the code (if you are not satisfied with the measurements). These measurements define the width and height of the popup window containing the “Share” information. The other bit of coding you can change is where it says; “Insert text or an image here”. This is where you can insert whatever element you choose to become the link. This can simply be text or a fancy button that you created yourself. The choice is up to you! Your iFrame tab must be a PHP file in order for this to work. If you are having problems getting this tutorial to work please reread the tutorial and try again, if you still cannot get it to work please leave us a comment below and we will respond as soon as possible. shadow down, a negative one up. the value, the more the shadow’s edge is blurred, as it can be seen above. shadow shape to expand in all directions by the specified radius. Try spicing up shadows with RGBa color. The box-shadow property can be used using CSS3 RGBa colors to create shadows with differing levels of opacity. If your browsers supports thebox-shadow property, then it will definitively support the RGBa color mode.